Many people unfortunately tend to think of the catastrophic man-caused global warming issue as an entity with just a single front to it, namely enviro-activists pushing it as a settled debate. When skeptic climate scientists and others supporting them say it is not settled, they essentially allow a vitally important facet of the issue – well known among enviro-activists – to go unchallenged: the issue has two fronts, and it is the second of those two, arguably a dog whistle for enviro-activists, which helps keep the issue alive among members of the larger uninformed public. 1) The science is settled. 2) there is no valid scientific opposition. 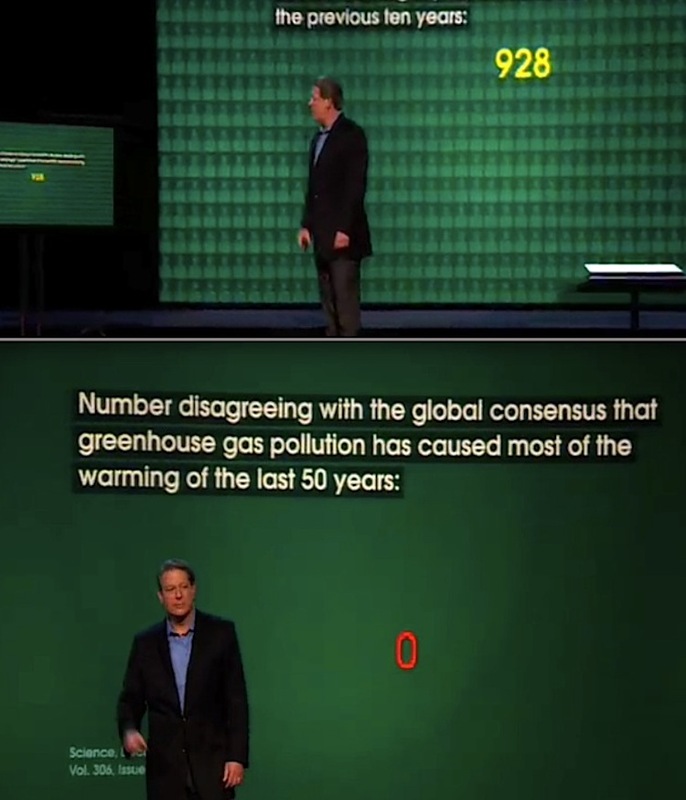 ‘No valid opposition’ doesn’t actually refer to the “97% scientific consensus”, a talking point recited by enviro-activists so that they don’t look foolish in saying there’s a 100% consensus, which is otherwise precisely what Al Gore indicated in his 2006 movie. When asked to give a specific name of who that “other 3%” might be, enviro-activists can’t name a single person, they instead sidestep with an assertion that any scientist critics to be found are industry-corrupted, and by default, such critics are invalid. This of course puts the consensus at 100% in their minds, whether they admit it or not. This isn’t just some stand-alone accusation. The full sentence is “Paid by Big Oil & Coal to lie in the same way Big Tobacco paid shill experts to lie to the public.” Finding uncountable numbers of narratives on the internet where the tactics of ‘Big Tobacco’ are compared to some ‘Big Oil’ conspiracy is as simple as trying variations of the words “tobacco”, “climate change” and “denial”, such as what’s seen here. One can easily see why enviro-activists embrace the comparison. It’s a no-brainer conclusion about what cigarettes do for human health, it’s why they’ve had the slang label of “coffin nails” for over a hundred years. And it is why anyone denying the harm of cigarettes is labeled as, well, a denier with all the other insinuations coming from that. It’s a settled issue. The science is settled, there is no valid scientific opposition because the only opposition to it is from industry-corrupted scientists who are paid by Big Oil & Coal to lie to the public, just like shill scientists did for Big Tobacco. Simplicity in action; scrutiny of an otherwise unsupportable assertion is diverted to a comparison to known enemies, which gives everyone a reason to ignore whatever skeptics have to say. For an added punch, enviro-activists counteract ordinary doubters by saying, “you have no input here because you are not a climate scientist.” If it turns out that the critic is a scientist, then they are part of the conspiracy to lie. See how this works? Critical thinking is what destroys this accusation. The most prominent speakers and pushers of the pro-global warming movement – Al Gore, Greenpeace, Naomi Oreskes, Desmogblog, and Ross Gelbspan – aren’t climate scientists, either; dissecting climate is vastly more complicated than understanding the results of inhaling an established unhealthy substance; and the biggest wipeout of all, no evidence has ever been offered as proof of an industry/climate scientist pay-for-performance arrangement during the two decades of this accusation, apart from the so-called ‘leaked Western Fuels memo’ having the strategy statement “reposition global warming as theory rather than fact.” Not only is this sole bit of ‘evidence’ not what Gelbspan, Oreskes and Gore portray it to be, it and the people pushing it are besieged with the problems I’ve detailed throughout this GelbspanFiles blog and in my numerous other online articles. Some hard-core supporters of the issue venture that evidence may yet be found to prove The Accusation true, particularly out of the recent “Exxon Knew” prosecution efforts by a collection of Attorneys General. Not likely, considering how this effort has an evidence source problem, a people source problem, and how the effort itself seems to be crumbling apart. Admirable that many on the skeptic side want to prevail with sound science alone in this issue, but the larger public will continue ignoring it so long as their faith remains intact in the “crooked skeptics” talking point. The situation changes entirely when they begin to comprehend how that central accusation talking point looks like nothing more than a carefully orchestrated propaganda line, then the other two points begin to collapse by default, which then leads the public to see what skeptic scientists have been trying to say all this time.